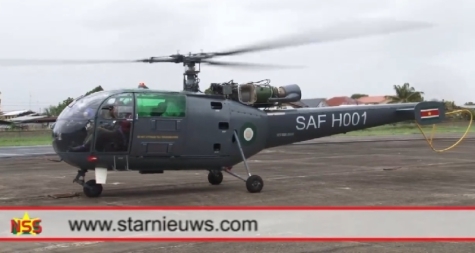 PARIS --- The Indian Ambassador to Suriname, the former Dutch Guyana, handed over three HAL Chetak helicopters to the Suriname Air Force on March 13, local media reported from the capital Paramaribo. The helicopters were christened by Defense Minister Lamure Latour. The Suriname Air Force currently has eight Indian-trained pilots, but are not yet qualified as pilots-in-command. Maintenance will be carried out by Indian ground support personnel, 8 of whom have been detached to Suriname, and will in addition benefit from Indian support. The helicopters were ordered in 2009 for $13.5 million thanks to a $16 million line of credit provided by the Indian government, but delivery was held up by unspecified “financial and administrative obstacles,” local media reported. The helicopters, manufactured by Hindustan Aeronautics Limited (HAL India), were manufactured, inspected and tested in India, then taken apart and shipped to Suriname. Indian technicians came to Suriname and have them put back together. Current plans call for one Chetak to be based at Paramaribo’s Zorg en Hoop airport, Nickerie’s Majoor Henry Fernandes Airport and Albina Airstrip. The HAL Chetak is a license-manufactured version of the 1960s-vintage Aérospatiale SA-316 Alouette III, a remarkably durable design especially suited for hot-and-high operations.